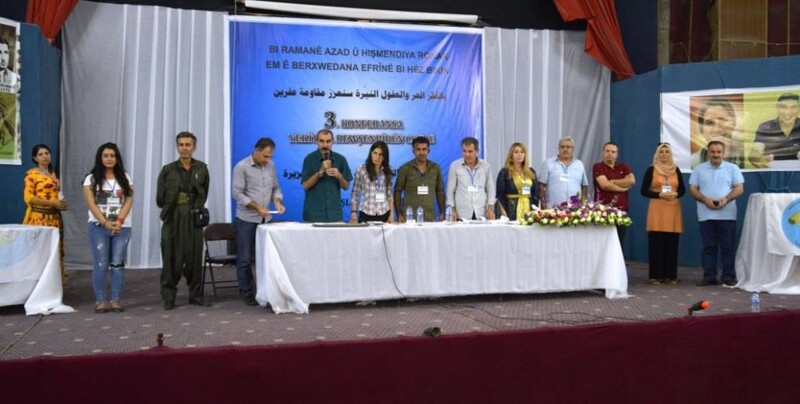 Members of the Jazira Intellectuals Union, TEV-DEM Executive Council co-chair Xerîb Hiso, Jazira Canton Foreign Affairs Council co-chair, Abdulkerim Umer took part to the Conference of the Jazira Intellectuals Union. Some 160 delegates met in Qamishlo. Speaking here, Xerîb Hiso talked about the important developments made on cultural studies in the region. He added that the YPG-YPJ fighters and the will of the people of Afrin were not broken, and that the people continued their resistance in Shehba. Hiso said that the occupation plans of the Turkish state were failing and that Afrin will soon be liberated. Hiso stressed that the invading Turkish army and its mercenary allies wanted to destroy the Kurdish people and underlined that the international community remained silent against the savagery in the region. Speaking at the conference, Jazira Intellectuals Union co-chair Leyla Ibrahim also said that Afrin will be soon liberated. Leyla Ibrahim also stressed that the conference was carried out in order to continue the struggle that the process required.